I mostly used this resource: http://selenium-python.readthedocs.org/page-objects.html regarding the Python.org example. What I want in the end, is to go through a list of addresses, launch the search, and copy the information displayed on the right hand side of the screen. print "address input not found"
Tried to access the item by ID, XPATH, NAME, TAG NAME, etc., nothing worked. What else could I try that I have not so far (using Selenium webdriver)? Are some websites really impossible to scrape? (I don't think that the city used an algorithm to generate any random DOM everytime I re-load the page). 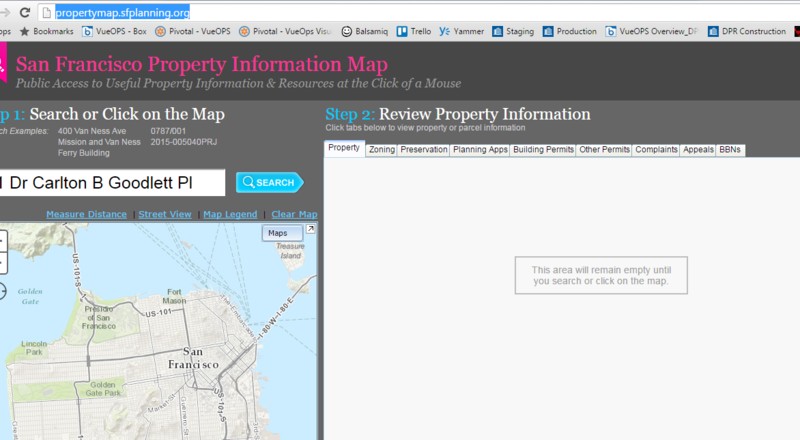 If you visit http://50.17.237.182/PIM/ in your browser, you will see exactly the same as propertymap.sfplanning.org/, the only difference is you have full access to the elements using the former. But if you want to pull data, you may find querying using the url an easier option, you will get some json back from the query.